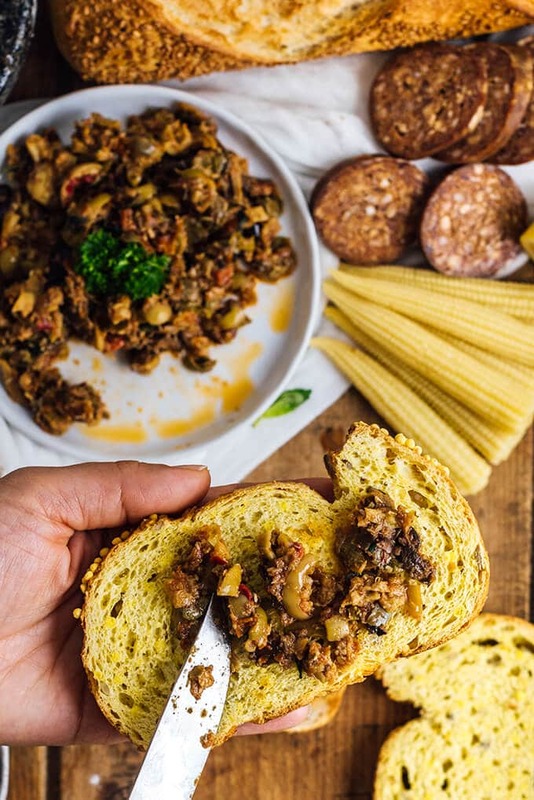 Sun-Dried Tomato Tapenade is a perfect combination of sweet, hot and tangy flavours. This makes a flavoursome spread as an appetizer on bread slices or in sandwiches. Having warmer days outside makes us crave for lighter foods. Our lunch or dinner could be a simple Turkish Style Potato Salad or Bulgur Salad on such days. We love to put these in airtight containers and take them to our favourite picnic area when we have time. When I feel lazy even to prepare a salad, it’s great to know that we have some sun-dried tomato tapenade in the refrigerator. I just grab the jar, a French baguette and some cheese to put our small picnic basket. 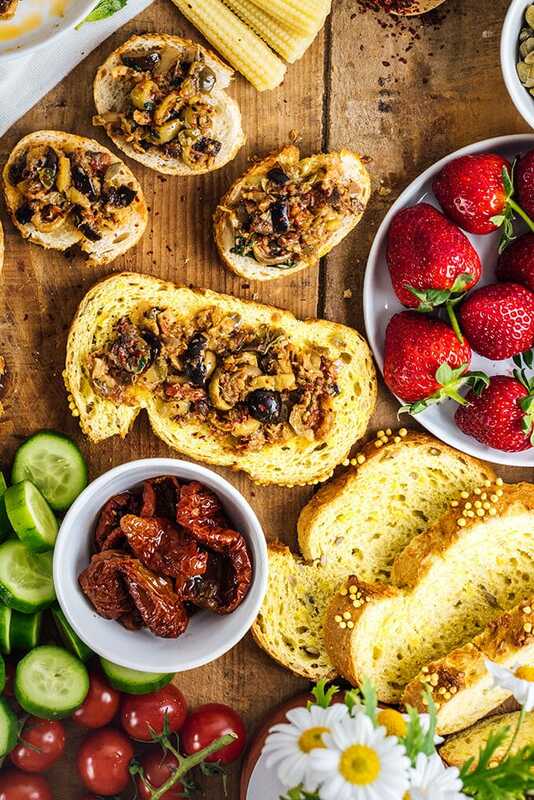 This sun-dried tomato tapenade recipe is our new favorite spread that satisfies all our taste buds. The use of this spread is endless. You can use it in pasta, sandwiches, salads or on bread slices or crackers to make the easiest snack. I think after all comforting soups and stews we had during winter, lighter recipes like this one brings spring to our body and soul. I think I’ll be making more picnic foods these days. This doesn’t mean that these recipes are limited to spring or summer though. Wouldn’t it be great to have this sun-dried tomato tapenade as a starter to celebrate holidays? I think baguette slices loaded with this yummiest spread makes one of the best appetizers to serve on game days or movie nights too. We love it with red wine or beer but you can pair them with whatever drink you like. Besides being a perfect appetizer, sun-dried tomato tapenade is a great food to enrich your breakfast. If you love savory foods for breakfast, you should give this recipe a try. Olives in all types have an important place in a typical Turkish breakfast, so this spread becomes the star of the table whenever I make it for friends in the morning. In a typical tapenade recipe, adding anchovies is a must but I want to keep my recipe vegan. I use sun-dried tomatoes instead. They give a slight sweetness to the spread, which I think balances all those savory flavors of black and green olives and capers. Also, I used a little hot red pepper flakes as we think any appetizer gets even tastier with a hint of hotness. If you prefer the easy way, you can just put everything in a food processor and blend until smooth to have a more paste like result. I love to prepare it in a mortar though because I love to use my mortar and feel like I have more control over the flavors and the texture this way. I taste and decide better whether it is okay or needs any additions. I use sun-dried tomatoes instead. They give a slight sweetness to the spread, which I think balances all those savory flavors of black and green olives and capers. Also, I used a little hot red pepper flakes as we think any appetizer gets even tastier with a hint of hotness. Using a mortar, mash the olives with capers, sun-dried tomatoes and garlic. Pound in the herbs. Add in olive oil, lemon juice, red pepper flakes and stir well. I use store-bought sun-dried tomatoes in olive oil, so I don’t need any soaking. If your tomatoes are dry, soak them in boiling water until they soften and then use them in the recipe. If you use a food processor, put everything in it and pulse until it’s chunky or smooth. 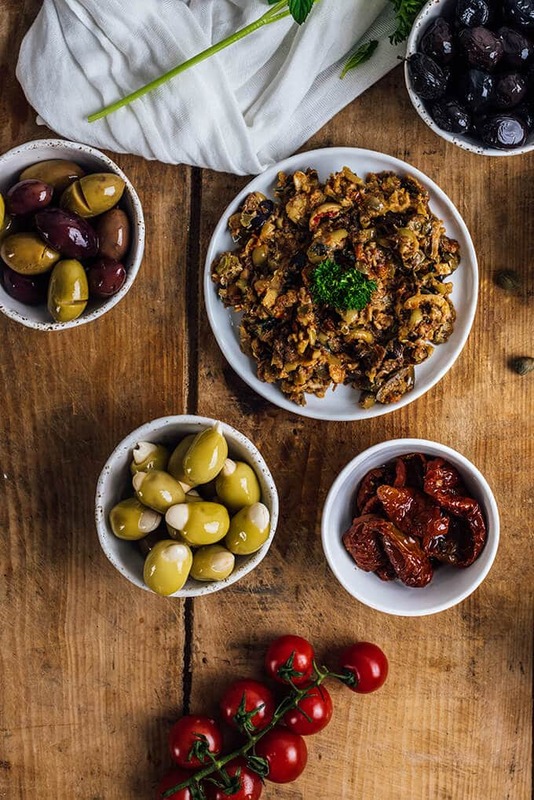 I love olives and tapenade, but never made this with sun dried tomatoes, great idea!